Life is full of disappointment. Have you noticed? As it happens, I’m writing this post during the holiday season (which can amplify feelings of letdown even further). All of us experience the blows of the fallen world from multiple different sources… perpetually. I have often experienced this as a broad-sweeping sense of sadness from things that did not pan out as I had hoped in life. When it happens, I force myself to get specific about what is really bugging me. Otherwise, it can be nearly impossible to get out from underneath the stormy clouds. As I dig down internally, the main culprits are usually relational situations that went sour, work situations where promises were made (or suggested) and not fulfilled, the pain of a loss (physical, health, financial, loved one, etc. ), and issues that simply are not resolvable (on this side of heaven). 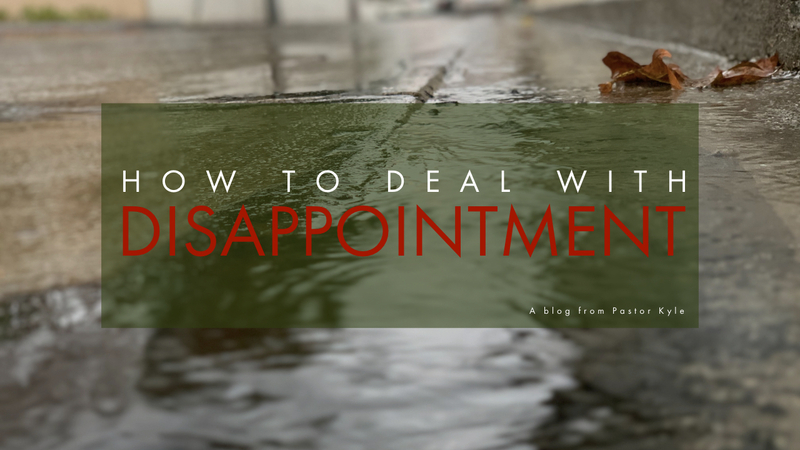 So… here are my thoughts on how to deal with disappointment. 1. Be REAL about it. I have found that it can be hard to honestly talk about disappointment in church circles… especially when you are the pastor! Generally speaking, the longer we walk with God, the more of God’s word gets into our brains/hearts right? I sure hope so. The Bible has lots of verses to inspire hope for humanity. It is The Source of spiritual strength to turn to minute by minute. The problem I run into is an unspoken assumption of sorts that Bible knowledge in and of itself will remove the human experience of disappointment. The truth is: it’s not that simple. What the Bible does is point us to God to find hope in our disappointment. For example, we read about the Holy Spirit being the Comforter/Helper who brings us a lasting peace that is unlike anything the world offers (John 14:26-27). The Apostle Paul encourages us to bring the things that worry us to God in prayer. In that process, God grants believers a “peace that surpasses understanding” (Philippians 4:6-7). In other words, Scripture is God’s tool belt and training manual to help us deal with disappointment. I submit to you that one of the keys to finding the comfort, hope, and peace of God is to discuss and process disappointment in a healthy environment. 2. Give yourself some time to hurt. CAVEAT: This is not permission to stay in a painful and negative mental place. I state that because otherwise you might interpret this point to mean pastoral permission not to heal. You don’t want to stay wounded and sick. You want to heal and be restored right? The goal of allowing ourselves time to hurt is to get everything out, to take an inventory of our emotions, and to systematically pray and surrender our disappointments to the Lord one by one. Some issues will need more time than others (especially relational issues dealing with breaches of trust and betrayal). Loss of a significant loved one often looks like a season of grief. There are all kinds of specialized support groups out there to help you process pain. One of the reasons we’re so big on small groups (for every season of life) is because you have a built-in, healthy network of individuals in your life to sit with you and be with you in your situation. After sitting in a painful situation, I find it vital to get outside a bit and move. I try not to let myself stay in a negative mental head space more than an hour or so. If I feel like I can’t shake something, I know I need to redirect myself a bit. Prayer walks have always been my primary form of deep communion and fellowship with God. Try it. 4. Celebrate the good that came from your disappointing situation. Even a few moments of self-reflection can help us to see that our pain has a purpose. God uses painful experiences to drive us to Him. Though it’s often hard to see in the midst of it, those hard things got us where we are right now. I promise you that good has come from your painful situation that is weighing you down. The thing is, we have to choose to find it. Psalm 27:13 says, “I will look upon the goodness of the Lord in the land of the living.” When dealing with disappointment, we get to choose to look at a situation through our painful lens or God’s good and purposeful lens. 5. Celebrate the good in your life right now. 6. Celebrate the good Jesus is doing through His Church. God is doing so many good things here and you are a part of that. You can take great pride in the shared mission of Jesus that we are moving forward in together. A big part of being a Christian is remembering that this life is not about us. This life is about what God wants to do for His Kingdom’s advancement through us. 1st Peter 2:11 says we are just “sojourners and exiles” on planet Earth. I pray that one of the good things you find joy in is Jesus’ Church. If not, it’s probably time for a gut check. The CHURCH is the #1 entity Jesus left behind to reach the lost world. So… those are some of the things I do to help me deal with disappointment. Leave a comment below and share some things that help you. We can all learn from each other. P.S. 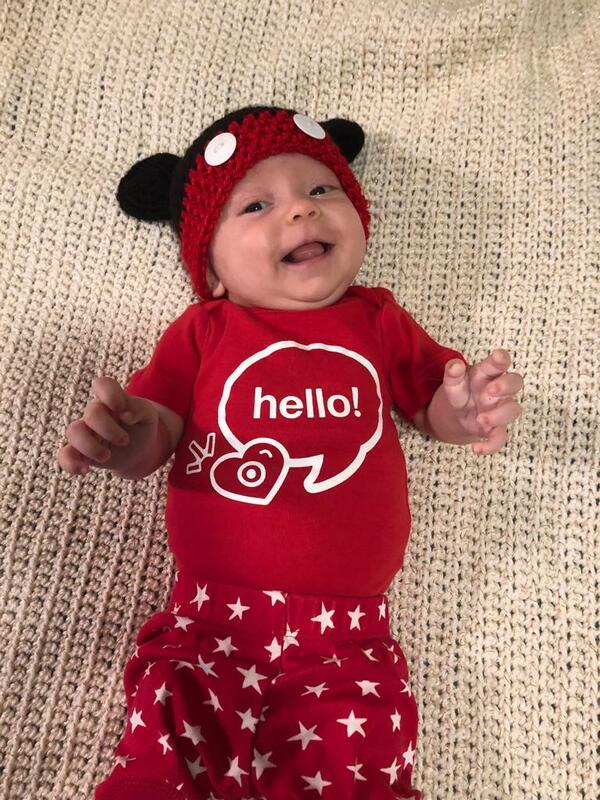 Here is the picture of Emersyn Lisa sent me that made my morning 100x better. Thank you Pastor Kyle for sharing this blog. As a Christian I’ve learned not to stay stuck on the why’s or to try to understand the impossible of what we’re going through. One of the ways I deal with life’s disappointments, griefs, pain, and heartaches, is believing that it’s only a temporary situation. I agree that we need to celebrate the good in our lives even during the hardships. No matter how difficult it is we need to be reminded and be thankful of what and who we still have in our lives. Having the support from family and friends is what helps make the toughest times easier. Most of all we can’t give up or stay stuck in despair. We need to continue having faith, hope and trust that God will renew us and make us stronger. Always believe that life’s unfortunate curveballs are only temporary situations that we will overcome with time and spiritual healing. Thanks so much for sharing your thoughts here Jen. I agree that reminding ourselves of the temporary nature of pain is really helpful. I also agree that we can’t give up and stay stuck there. Good stuff. Thank you Kyle for sharing. Just last night a storm landed hard in my life. It had been brewing for awhile and I’ve been fighting it for awhile. It has brought such pain, disappointments, sadness anger you name it. I know I’m a survivor and will come out of it stronger then when I went in. I ask for your prayers. Michelle, I will absolutely be praying for you and this storm that just hit. Know that we are here for you as a church too. Hope to see you and pray with you this Sunday. That picture would make anybody smile what a wonderful thing having a loving family Kyle you are truly blessed by the family you have and the family you and your team is building ❤️What helps me is long walks with my dog Red Messick I pray and just clear my head I think blood flow is important to get negative thoughts out love you so much Pastor Kyle you have made a big deference in my life .